Whoever first said “everything in moderation” obviously never tasted a kale chip. Or, for that matter, anything smothered in olive oil, garlic, lemon, and salt. Now, if you’re as into kale as I am (sooo original, I know), the chip variety has likely been on your radar for some time. You’ve probably tasted kale chips with Parmesan or soy sauce, maybe even chili pepper, if you were feeling adventurous. In my book, anything goes, because just about anything tastes great on a crunchy chip. Those of you who are not kale devotees are probably thinking, “yeah, on a crunchy potato chip,” but you are mistaken. Namely, because Lays just released Cappuccino flavored potato chips. But also, because kale chips really are better. When done right, they’re crunchier, more flavorful, not to mention healthier and very easy to make. When baked, that abhorred greenish flavor crisps away, so that most of what you taste is garlic and lemon, or whatever ingredient you used to garnish your chips. Flavor aside, Let’s discuss texture. Potato chips are dangerous. Bite down the wrong way and the roof of your mouth with never forgive you. Kale chips, though? Imagine walking through a field of autumn leaves and hearing the satisfying crunch of each one being crushed beneath your boots. Now, imagine that happening in your mouth. Isn’t that much more pleasant that chewing on a potentially hazardous material? Thought so. So there you have it, folks. Kale chips are good. Really good. In fact, I recommend that you make extra because you’ll probably end up eating half the batch before you’ve even finished cleaning up. BUT! And, this is a big but. 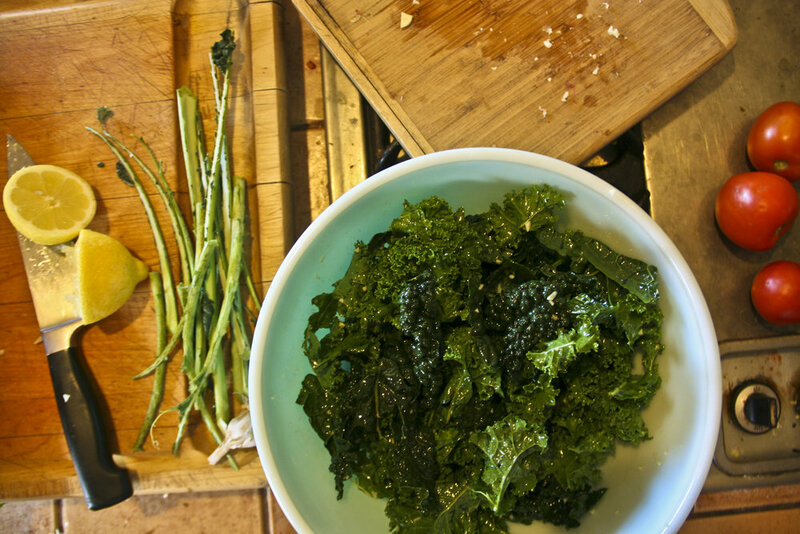 Kale requires a little TLC before it transforms into amazing kale chips. Here are some tips, no matter if you choose to use this recipe, or create your own. 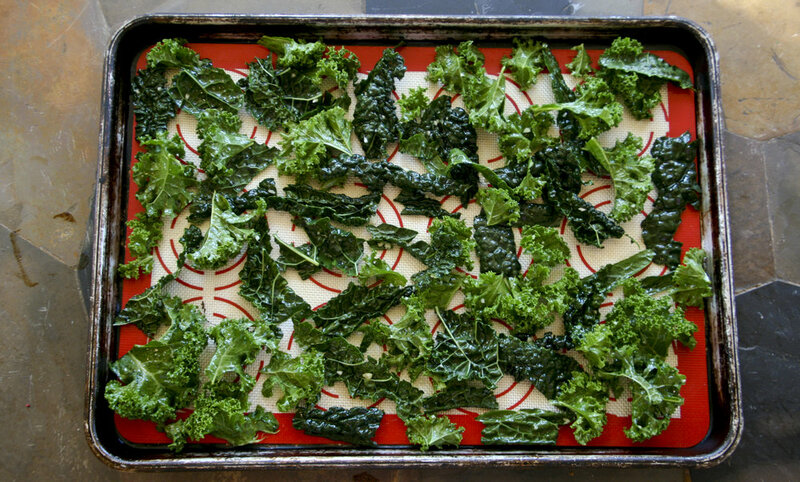 Make sure your kale is extra dry before embarking on the chip crafting process. Wet kale means that it could steam in the oven, and you didn’t sign up for soggy flaccid kale, did you? Choose your liquids wisely, and always add oil first. The oil is the key ingredient to crunchy leaves and it helps your spices and toppings stick to the surface. Add other liquids after all the leaves are completely coated with oil. Using too much other stuff will steam the kale, rather than bake it, so take that as fair warning. Let your chips rest once you’ve removed them from the oven. This will allow them to crisp up a little more. Then, move them to a flat surface and give them enough room to keep them separated from each other. Especially when still hot, the chips are still in danger of losing their crunch, so don’t stack them! Remember to share! This can be tough, considering how good they are, but do your best. I believe in you. 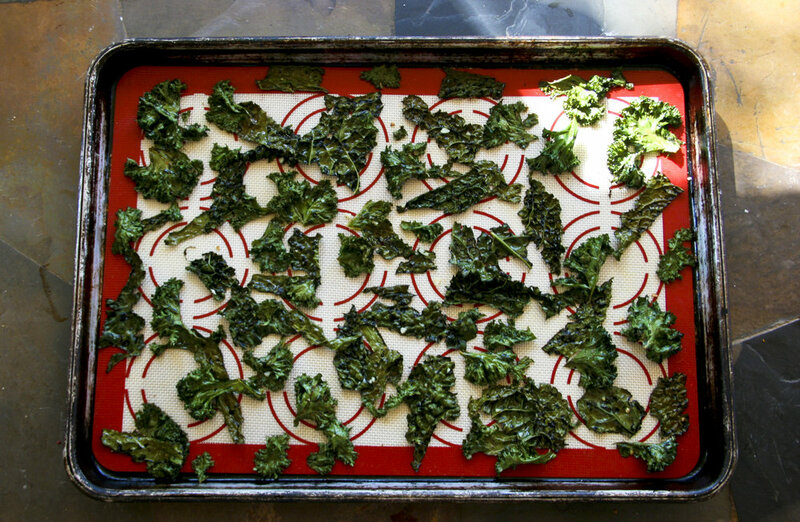 Rinse kale and tear into chip-sized pieces. Use a salad spinner or cloth towel to dry completely. In a large mixing bowl, combine kale and olive oil. Make sure that each little crevice is coated for optimum crunch. Add garlic, lemon, and salt and toss to combine. Let cool for 2 minutes, then transfer to a flat surface to rest. Again, don’t stack the chips! Enjoy right away or store in a closed container.